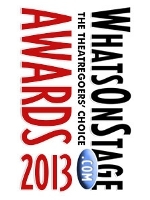 It’s that time of the year … to nominate for the annual What’s on Stage Awards! The awards shortlists – covering the best of London theatre (and a bit beyond) – are drawn up with the help of thousands of theatregoers who log on to nominate their favourites. Nominations are open until November 30, and are announced at a star-studded launch event held in early December. Then … voting opens and will run until January 2013. In 2011/12, over 70,000 theatregoers logged on to vote, with leaders in many categories fluctuating dramatically from day to day. In the end, almost every year, the determination of some fields comes down to just a handful of votes.